Need charts but don't have the time to build them? We offer a chart-building service to site subscribers. Need help using the program? Contact us for private lessons. What is Drum Chart Builder? Drum Chart Builder is a web-based software program for creating, managing, and viewing drum charts and setlists. The unique format is based on Easy Drum Charts by pro drummer, educator and author Liz Ficalora. Drum Chart Builder works in any web browser that supports HTML5. Older browsers such as Internet Explorer 8, or the Android browser prior to version 4 may not work correctly. If you have issues on your device, please contact us. You may sign up for a free trial, which allows all program features to be used. What is an Easy Drum Chart? 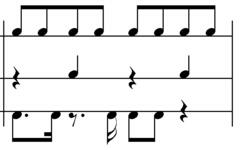 It is accurate and simple drum music that focuses on the form of the song rather than bar after bar of music notation. This allows drummers to know exactly where they are in the song, play the time patterns and fills in the right places, and maintain focus on the groove of the song. What are the benefits to using Easy Drum Charts? Each chart is written on one page, so no page turning is required. And since the song form, bar counts, and drum instructions are clearly written, drummers can focus on playing the song, rather than reading cumbersome traditional music notation. 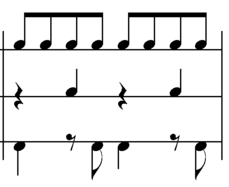 The patterns are notated on 3 lines, allowing for quick reading — even for drummers with limited music reading ability. What if I don't read notation? Only a basic knowledge of notation is required. For the basic charts, only quarter and eighth notes and rests are used. What is a basic drum pattern? What is an advanced drum pattern? Where do I learn more about Easy Drum Charts? Visit easydrumchart.com for more information, including drum charts for purchase, and links to Liz Ficalora's book "How to Write a Fast & Easy Drum Chart" from Alfred Publishing.